From Goodreads ~ After finally becoming partner at her advertising agency, Haley Hanson barely has time to plan her Christmas Eve wedding with her fiancé, Jeff. When their perfect location falls through at the last minute, they need to find a new venue fast. But everything is booked for the holidays, except for the place where Haley and Jeff fell in love, Christmas Camp. With time running out to transform the inn into a winter wonderland, Trisha, a top wedding planner is brought in to help; she also just happens to be Jeff’s ex-girlfriend. 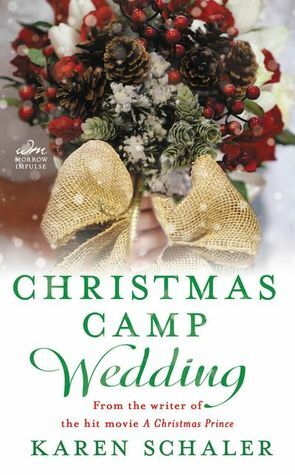 Will Jeff and Trisha’s Christmas past get in the way of Haley’s Christmas future, or can Christmas Camp still work its magic for a holiday happily ever after? Haley and Jeff met and fell in love last Christmas. Her boss had sent her to Christmas Camp to help her discover Christmas ... Jeff's dad, Ben, runs the camp. Haley and Jeff are now engaged and getting married on Christmas Eve at her parents' soon-to-be-opened B&B. It's part of a marketing plan to entice others to go to the B&B and get married there too. A couple days before the wedding, pipes break and the wedding is moved to Ben's B&B. No problem, right? Ben has even found a wedding planner named Trisha for them at the last minute. When Haley discovers that Trisha is an ex-girlfriend of Jeff's and is still in love with him, that adds even more stress than Haley needs. This is the second in the Christmas Camp series (I read the first one last month). I don't usually read romance stories like this but I was interested enough to want to find out about Haley and Jeff's "happily ever after" (I assumed there would be one). I did find it hard to believe, though, that Trisha and Jeff had broken up three years ago, she was still in love and pining for him, while she wasn't important enough now to him to tell Haley about her. And I can't believe Haley's friend, Kathy, was in love with Jeff's friend, Steve, and thought he might be "the one" after just meeting him yesterday. This story is written in third person perspective from Haley's point of view. It was a light read with a happy ending for all. There are some recipes at the end.